When your tax return is initially received and reviewed by the CRA, you will receive a Canada Revenue Agency Notice of Assessment. However, you may be reassessed later on. What is a Notice of Assessment/Reassessment? Have you received a Notice of Assessment or a Notice of Reassessment from the Canada Revenue Agency (CRA)? Although these statements can be difficult to decipher, they are crucial to protecting your rights as a taxpayer. 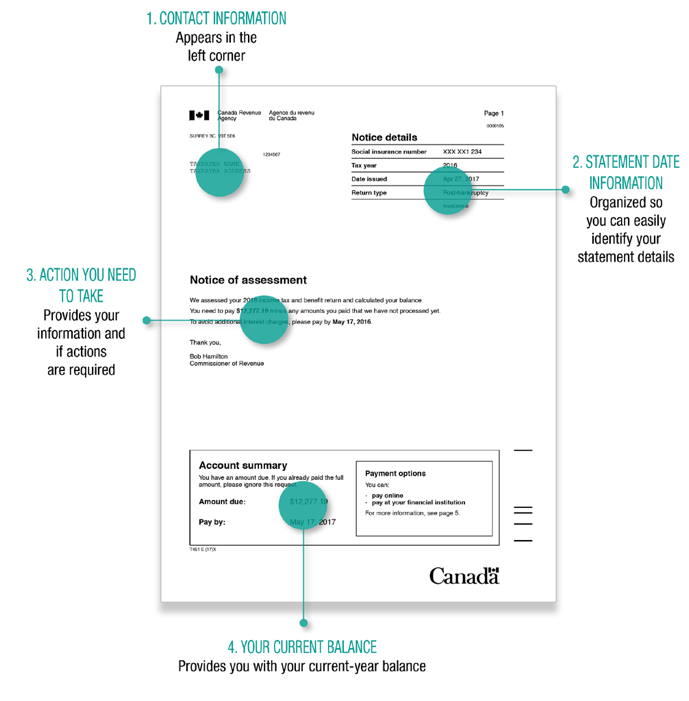 A Notice of Assessment is a statement sent to you after the CRA processes your tax return. Normally, you receive a Notice of Assessment after you have filed your tax return. However, if you have not filed your tax returns, the CRA may file returns on your behalf and then issue you a Notice of Assessment, also known as an arbitrary/notional assessment. In contrast, a Notice of Reassessment is a statement that is issued when the CRA changes a previously filed return that has already been assessed. These reassessments can result from anything that caused an update to your previous Notice of Assessment such as audits or adjustments. How do I Read a Notice of Reassessment or Notice of Assessment? The purpose of the notices is to outline the result of the assessment including the date of issuance, refund or balance owing, and any action needed to be taken. Reference the guide below to learn how to read your Notice of (Re)Assessment. How Far Back Can the CRA Reassess Returns? The normal reassessment period is three years after the date on the original notice of assessment issued by the Canada Revenue Agency. However, if the CRA suspects tax fraud, carelessness, or evasion, they can go back much farther. This includes situations where the CRA believes that a mistake or misrepresentation on a return was made due to gross negligence. For this reason, it is still crucial to keep all books and records for a minimum of six years from the end of the last tax year to which the documents relate. Taxpayers who disagree with a Notice of Assessment or Notice of Reassessment can dispute it by filing a formal appeal, called a Notice of Objection, to the Appeals Division of the CRA. Generally, objections must be filed within 90 days of the issue date of the assessment or reassessment, although an extension of up to an additional year is possible. Disputing with the CRA is complex, time-consuming, and can be difficult for the taxpayers. We help our clients draft and submit Notice(s) of Objection, prepare additional submissions to the CRA to substantiate their claims, and communicate with the CRA on their behalf until a decision is rendered. Working with our team gives our clients the best chance of success. Our firm has successfully used Notices of Objection to contest various administrative decisions of the CRA including audits, previous objections (where permitted), arbitrary assessments, denied applications, and more. Farber Tax Solutions offers a range of services to help you navigate a newly issued CRA Assessment or Reassessment. Our experts can help you understand your rights, guide you on strategy, and represent you at the audit, objection or tax court stage. Our team of professionals bring extensive experience to ensure that your audit or tax dispute is resolved smoothly and that your rights as a taxpayer are respected. We are committed to supporting you throughout the entire process and are here to help at every step of the way.